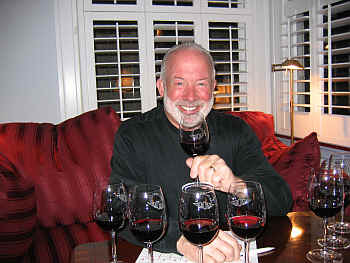 With interest in Syrah on the rise, host Tim Zainer wanted to survey this lovely red grape from various wine regions. 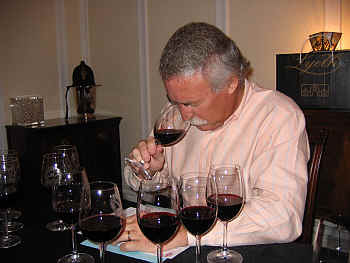 We assembled a set of eight wines, including a couple from Chile which I thought would show well. We had a wine from Israel, Austria, Spain, South Africa, Italy's Val d'Aosta and an Aussie wine from a collaboration between an American wine importer and French Rhne Valley vintner Michel Chapoutier. My two Chilean picks tied for first place, with the Israeli and South African entries rounding out the "upper division." There were no real "stinkers" in the line-up, though one might question the pricing of a few of the wines (like that's unusual!). 8th Place: LES CRTES 2003 Val d'Aosta "Coteau La Tour"
This wine comes from the mountainous northwest corner of Italy and the wine simply lacks the "stuffing" to fare well alongside bigger, deeper wines. I found a medium ruby color to this mildly candied Syrah. I described the nose as showing hints of talcum powder fragrances, too. It's a shallow, smaller red wine than the rest of the field. I suppose tasting this alongside the white wines from Les Crtes, one might be able to find more Syrah here. In this crowd, the wine was lost. No stars on my three star scale, as this was but a standard quality red. 7th Place: TERLATO CHAPOUTIER 2004 Australian (Victoria) "Shiraz-Viognier"
The nose of this medium-ruby colored wine started out nicely, but it never seemed to develop much. I found some light berry fruit and just a hint of a smoky, hickory tone to its aromatics. It seemed to hold some promise, but it didn't deliver on the palate. 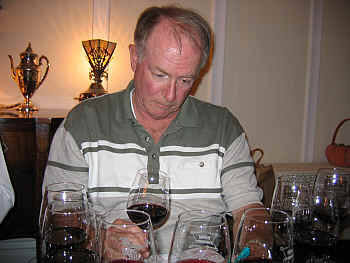 The wine is medium-light bodied and was merely a 'standard' red wine in the mouth. There's a bit of tannin and a whiff of a smoky flavor, but the wine doesn't "go" very far. In being charitable, I'd give this a one-half star rating, but it's disappointing coming from a producer such as Chapoutier. 6th Place: LEITNER 2001 Burgenland "SY No. VII"
Leitner's wine had the lightest color of this set, being a light cherry red garnet tone. The wine was hugely expressive on the nose, displaying a wonderful peppery spice fragrance. The intensity of the aromas was a surprise, as visually, the wine is the lightest of the set, but aromatically it packs a punch! It's a medium-bodied Syrah with tremendously spicy flavors. The pepper that shows on the nose is in evidence in the flavors. 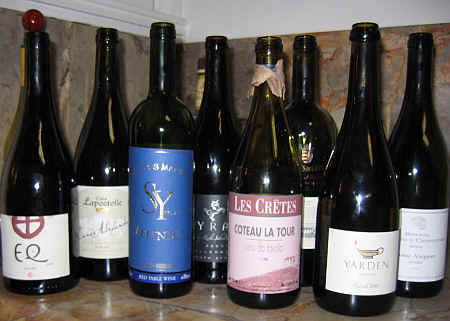 Though it's not a blockbuster, wine-on-steroids sort of Syrah, I gave it high marks for its intense varietal character. It's delicious now and should remain in good shape for 3-6 more years. This medium ruby red wine shows lots of red fruit fragrances, with a nice berry theme, but I couldn't say with certainty that it's Syrah. It's a nice, medium-full bodied wine with jammy raspberry elements and a strawberry-like note on the palate. It's moderately tannic and has some structure, so I didn't care for the "soft center" and "hard exterior" of this wine. It's, for me, an "okay" bottle of red wine, but not worthy of its lofty price tag. A deep ruby color was followed by a tarry, woodsy, tree bark-like character. I also had adjectives such as cola in the mix here...it's quite different from everything else in the tasting. When we unveiled the wines I thought of other South African reds I've been tasting this past year and how this wine has the same, rather strange wood note to it. I'd be surprised if this ages especially well, since it seems "old" and quite mature presently. I used word such as "candied orange peel" and "rustic" in describing it. Charry, to say the least. Perhaps worthy of a half star rating, but it's peculiar. Sporting medium ruby color, the Israeli entry had a nice plummy fragrance and deep berry fruit on the nose. 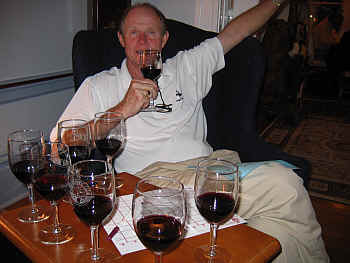 It's medium to full bodied. 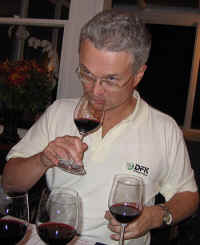 I found deep, dark fruit on the palate, with lots of dark berries and a hint of spicy licorice-like notes in the flavor. It's got a fair bit of tannin, too. One star. Deep, dark ruby in color, verging on inky, this wine had loads of sweet fruit aromas. It's berryish and sweetly-oaked on the nose. Woodsy, nice, internationally-styled red. While I enjoyed this nose, I found it less Syrah-like than my top two wines. It's a full-bodied, rich red on the palate. Deep, dark fruit flavors and there's a moderate level of tannin here. Still, it's a lovely red wine, even if it lacks a measure of typicity or varietal character. Very fine. Two stars. Deep ruby red in color, this wine displays great cassis-like fragrances with notes of olive and an herbal element which is quite reminiscent of Northern Rhne reds. There's also a whiff of mint on the nose. Medium-full bodied, this is moderately tannic and well-structured. It shows great berry fruit flavors and a touch of peppery spice. Delicious now, I suspect it will be fine for another 5-8 more years. Two+ stars. Showy wine.